Female pandas are first in heat when they are 6.5 years old and they typically stay in heat between two and seven days. However, they will neither mate nor give birth until they reach the age of 7.5 years. 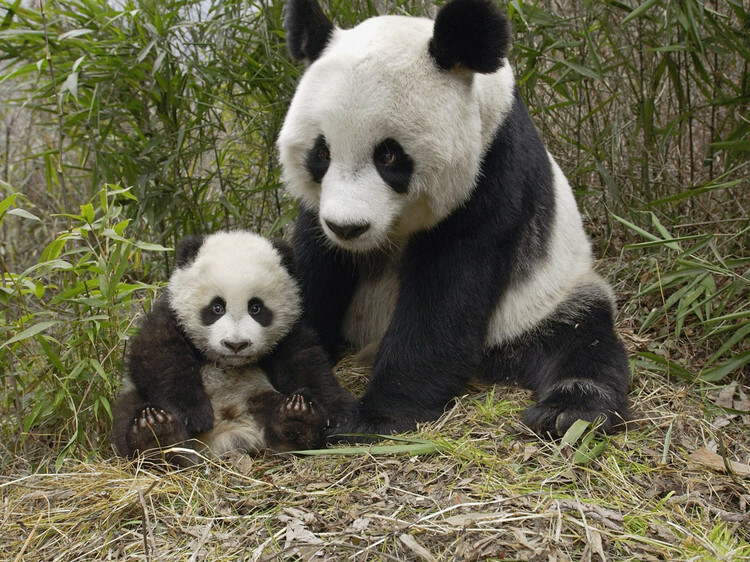 Pandas only breed once per year and the mating season is usually from March to May. During the entire period when a female panda is in heat, it can mate with several male pandas. The average reproduction period of a female panda lasts between five and seven years and they can give birth at least three times. The female panda usually gives birth to one cub at a time, but she can also give birth to two cubs, which is very rare. However, the mother can only raise one cub at a time when in the wild. Once the female panda’s egg has been fertilized, the pregnancy lasts for three to five months. The panda looks for a hollow tree, a windless cave, or rock cavity to give birth where it delivers one or two cubs. To prepare, the female panda often makes a warm bed with dry bamboo twigs and leaves. The newborn cub is usually very vulnerable. Its eyes are closed and it has a red body that is covered with white hair. In many cases, the cub is usually weak and it cannot even stand by itself. The average weight of a newborn panda cub is just a few ounces and they measure about seven inches long. The female panda eats a lot of bamboo throughout the pregnancy period in order to store sufficient nutrients for delivering and raising the cub. It breeds the cub in a cave and it only walks out of the delivery cave occasionally, mainly for evacuation. When the cub is about one month old, the mother can walk out for food and water, but it soon returns to the delivery cave to take care of the cub. The female panda often warms the cub with her body, licking and kissing it until it can walk. When the panda cub is one month old, hair starts growing out and it grows to be about two pounds. By the time the cub is three months of age, it has normal eyesight and it can also walk by itself. In the spring when the cub is about half a year old, it reaches about 26 pounds. At this age, the cub learns how to live in the wild and eat bamboo.